Walking and weight loss go hand in hand. If you need to lose weight, begin your efforts by enjoying more walks at different times of the day and in different places. Set yourself up for success by being prepared for anything! No matter how eager you are to get started, it’s better for your body to gradually build up for distances and speed. Start as a minimalist, and work your way up. Wear clothing that is loose, comfortable and very appropriate for the temperatures. Wear layers so that you can remove items as you get warmer too. Plain cotton is what’s most comfortable for the majority of folks who enjoy walking, but suit yourself! Great music can mean the difference between logging an extra half mile or not! Get your hands on a personal portable player and fill your ears with the sounds you love best. Of course, don’t forget to use caution when crossing roads if you can’t hear the outside world! Even if spending a lot for anything makes you cringe, don’t skimp on your shoes. Consider them a long-term investment in your weight loss goals and in greater health. Try them before you buy them, and do research on the brand as well. Wear them in a little bit before going on a long walk, to avoid blistering too. Practicing proper posture will not only maximize the exercise benefits you get from walking, but it will also help to reduce the aches and pains you’re likely to get from it. Good posture can also keep you in stride, so shoulders back and spine straight! If you start to get bored, a change of scenery should perk up your level of interest. Drive to a hilly area or state park where you can turn your walk into a hike. Bring a healthy snack and bottled water, and make sure you can navigate your way back! Talk to people in your family or neighborhood and see if you can’t get them interested in walking too. 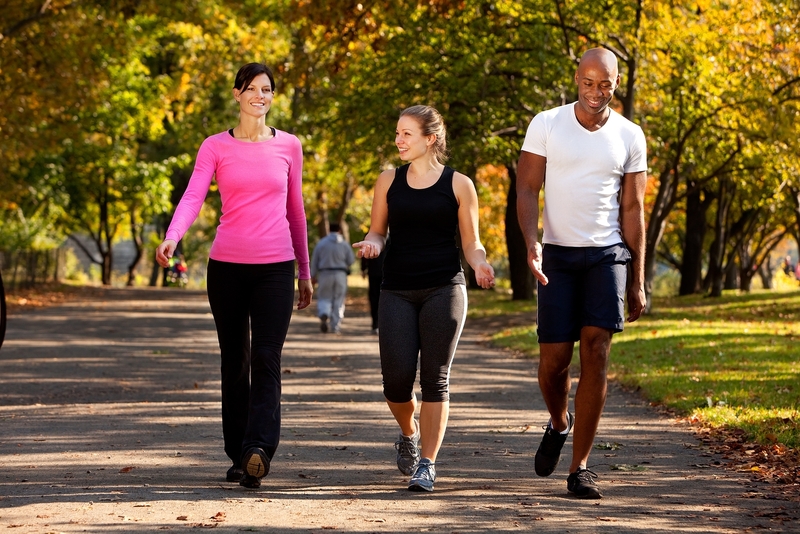 Even for those who don’t need to lose weight, walking is very healthy. Having friends join you will give you one more reason to stick with the program. Use this handy little device to measure your progress and to challenge yourself. Make a mental note of how many miles you logged the previous day, and keep doing better! Anytime you drive somewhere, you can choose to create an opportunity to walk too. Park further and further away from your intended destination and use your own two feet for the rest of the way. Be it to work, yard sales or the mall, you will be making walking a bigger part of your life and reaping plenty of benefits for it. Once you’re more fit and able to endure greater challenges, try walking faster. While the length of your stride really doesn’t impact the amount of calories you work off, your pace does. Pick it up a little bit more each time you go out until you reach a brisk and highly beneficial rate of speed. Your success with walking and weight loss will depend on your level of commitment. The more enjoyable you make the walking, the more likely you are to remain committed. Do what works for you, and in the long run, walking will help you lose weight!